I had started writing a post about using Dell CCTK to configure BIOS settings during an OSD task sequence but never finished it. When I went back to complete the post months later I found that Dell had come out with a new set of tools and CCTK is now part of these tools, the Dell Client Command Suite. I looked at the new CCTK, or Dell Command | Configure, and found it much the same as it was before. 2) Set a standard BIOS password. 3) Set the BIOS settings we want. Download Dell Command | Configure from the link off the Dell Client Command Suite page. Install the Update Package on your workstation so you can make configuration files. You will find a new program called Configuration Wizard with the Dell icon, or you can run it from Program Files (x86)\Dell\Command Configure\cctkgui.exe. 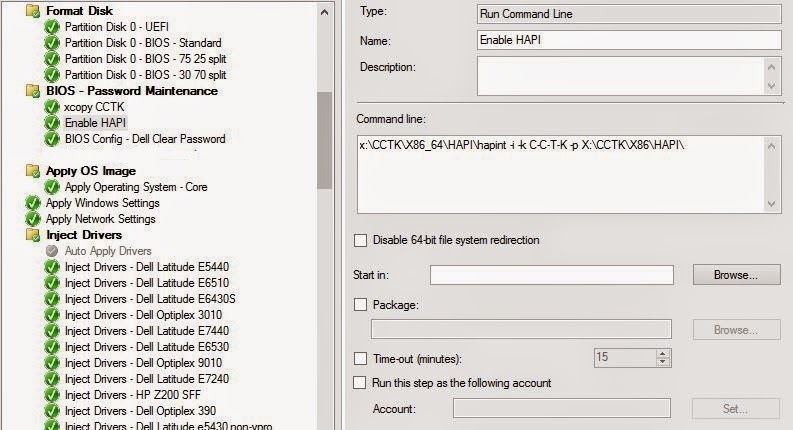 Call this script clear.cmd and put it on your source directory along with the cctk.exe program from Program Files (x86)\Dell\Command Configure\X86_64 folder, our just copy the Dell Command Configure folder to your source since that's easiest. Next in your deployment task sequence you will need to identify where you will do the Bios password clears and set during deployment. We clear the passwords and set our standard one early on, right after partitioning and formatting the disk. In the Command Line section put the name of the clear script you created. This will call the script, which will run cctk.exe with each password in your list and attempt to clear the bios password. After the bios password has been cleared we install the OS, update the bios, configure the bios settings and set a standard password. Stay Tuned for Part 2, Setting Bios Settings.